China is planningto launch a second spacecraft to explore the moon even as its first lunarorbiter continues to map the lunar surface, the country?s state-run mediahas reported. The newprobe, Chang?e 2, is slated to launch sometime in 2009, according to reports bythe Xinhua News Agency and China Central Television. Ye Peijian,lead designer and commander of China?s Chang?e 1 lunar orbiter currently circlingthe moon, announced plans for the second mission, but provided little additionaldetails, Xinhua reported. 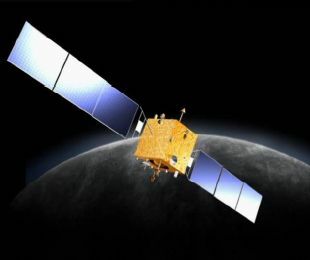 Chang?e 1 isa 5,180-pound(2,350-kg) satellite that launched Oct. 24 from China?s Xichang SatelliteLaunch Center in the southwest Sichuan Province to spend about one year mappingand studying the moon. The spacecraft is based on China?s Dongfanghong 3telecommunication satellite platform and equipped with eight primary instruments,though Ye did not state whether its Chang?e 2 successor would be based on asimilar design. But the successof Chang?e 1 to date, especially its survival of a Feb. 20 eclipse thatstarved its power-generating solar panels of sunlight, have been underdiscussion, according to a series of reports by Xinhua and otheroutlets. ?Chang?e 1passed the test,? Xinhua quoted Ye as saying after last month?s totallunar eclipse. The eclipse forced the lunar orbiter to consume about 40 percentof its overall battery power, less than the 60 percent expected before theeclipse, and left it out of contact with flight controllers in Beijing for about49 minutes, Xinhua reported. The eclipseleft the lunar probe without direct sunlight for about 80 minutes, though itdid fire its rocket engine to tweak its orbital path to minimize the time inshadow, Gu Shen, deputy director of Chang?e 1?s measurement and control systems,told Xinhua. On. Feb.21,Chang?e 1 beamed home its complement of 30 songs as part of China?s LanternFestival celebration to mark the end of the country?s Lunar New Yearfestivities, Xinhua reported. China?sChang?e 1 spaceflight is part of a three-stage plan toexplore the moon with orbiting spacecraft, rovers and ultimately a samplereturn mission. The ChinaNational Space Administration is also preparing to launch the nation?s thirdmanned mission, Shenzhou 7, later this year. China is only the third countryafter Russia and the U.S. to launch astronauts into orbit. The country?s firstastronaut Yang Liwei launched into orbit in 2003 during the Shenzhou 5 mission,with a two-astronaut crew following aboard Shenzhou 6 in 2005. Shenzhou 7is expected to launch three astronauts into space and feature China?s firstspacewalk. Hardware tests of the mission?s airlock and spacesuits have met with success, according to past Xinhuareports.